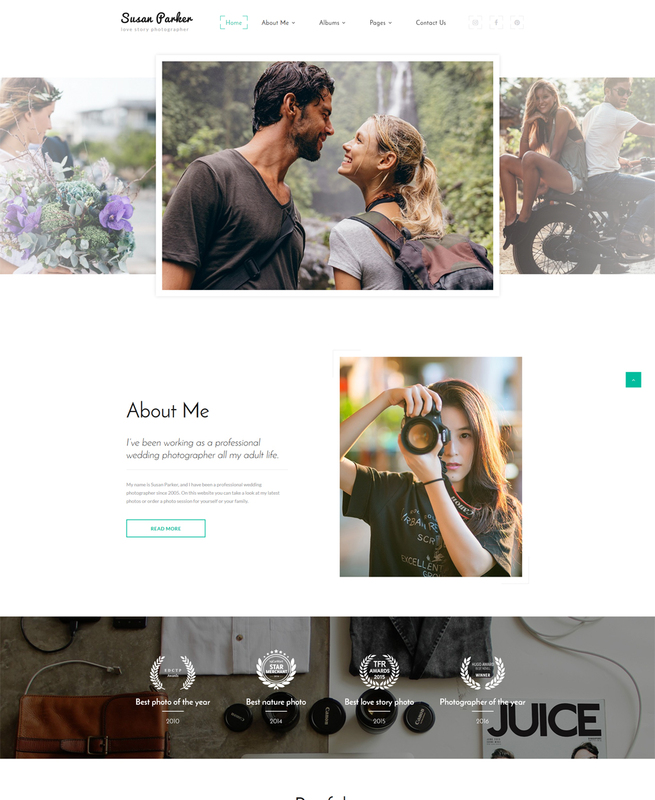 This stunning Online Portfolio Web Template was specially crafted for those, who want to present their photography works on the web with style. Its eye-pleasing design and neat color scheme will have a soothing effect on visitors and provide for an enjoyable on-site experience. Thanks to the responsive layout, built with Bootstrap 3.3, your site will quickly adapt to any gadget with any screen size the user has in hand right now. Text and images are flexible as well, so they will be rendered correctly. This will boost your conversion as your visitors will not be restricted by any limits in terms of their location or device. Apart from the classy look, the template was enriched with parallax effect, which will add 3D depth to your content. Rich UI kit plus several header and footer options will give you an opportunity to refresh the design of your future online presence. Find out all secrets of Online Portfolio Web Template with the live demo preview. Responsive design renders an online page same nicely on any kind of display screen size. Responsive design delivers a much better UX for those people who view a webpage on a smartphone or any other gadget, as well as helps to boost positions of a website in Google search. Are there any limitations on selling the Photography Classes website design as the integral part of my new product? Will the website design for Design & Photography be deleted from TemplateMonster database? No, the website design for Design & Photography will not be deleted from TemplateMonster database. Can I get the extended license for some other pricing than the half of the initial website design template for Fashion Photographer price? No. The price for purchasing license for a single website design template for Fashion Photographer is the half of the template unique price. Is it possible to use your Photography News website designs to develop websites for my customers? Yes. It is perfect for designers who want to offer their customers a high-quality design and also save time and money. Keep in mind that when you purchase the Photography School website design with ordinary or exclusive license you're entitled to create only one project (one domain name). Can I customize the website design template for Photography School? Yes, you can customize the website design template for Photography School to any extent needed. You cannot use a header of the template for one project though, and images from the template for the other project. Can I customize the website design for Photo Classes if that's required by application settings? Yes, you can customize the website design for Photo Classes code, graphics, fonts to any extent needed. In what cases I don't need the extended license for Photo Album Portfolio website design templates? What is the price for acquiring the extended license for web template for Design? There is no set price for acquiring the extended license. The price is based on the web template for Design's unique price for those templates you would like to use for the integration. The price for purchasing license for a single template is half of the template unique price. How can I modify website template for Photography News Portal to suit my particular website? Please visit our Online Help Center to obtain detailed instructions on editing website template for Photography News Portal. Make sure that these charges for Photographer Portfolio website design have different order IDs. If it is so, contact our billing department. What is the difference between unique and non-unique web template for Photography Courses purchase? Non-unique purchase:Non-exclusive purchase means that other people can buy the web template for Photography Courses you have chosen some time later. Unique purchase:Exclusive purchase guarantees that you are the last person to buy this template. After an exclusive purchase occurs the template is being permanently removed from the sales directory and will never be available to other customers again. Only you and people who bought the template before you will own it. What am I allowed and not allowed to do with the website templates for Design & Photography? You may: Build a website using the Photo Album Portfolio website template in any way you like.You may not:Resell or redistribute templates (like we do).Claim intellectual or exclusive ownership to any of our products, modified or unmodified. All products are property of content providing companies and individuals.Make more than one project using the same template (you have to purchase the same template once more in order to make another project with the same design). Can I use graphics from website design template for Photography Magazine I purchased for use in printing? Yes, it's not prohibited to use the website design template for Photography Magazine graphics for printed material, but the resolution of the templates graphics ( except for logo templates) is not enough for printing. Can I integrate the website design template for Photography with third-party software or applications for development of my new products? No, you cannot get the developers license for development of website design template for Photography or other products. Can I get the website design template for Photography Lessons in higher resolution to use for printing? No, we design Photography website design templates optimized for web resolution only. Are there any restrictions for using imagery, cliparts and fonts from the website template for Photography News Portal I purchased? All imagery, clipart and fonts used in website template for Photography News Portal are royalty-free, if not stated otherwise on the product page, and are the integral part of our products. One Time Usage License and Developers License give you the right to use images, clipart and fonts only as a part of the website you build using your template. You can use imagery, clipart and fonts to develop one project only. Any kind of separate usage or distribution is strictly prohibited. Is it possible that Template Monster will contact my client which website I made from Template Monster's website web template for Art Photography? Yes, our legal department checks licenses regularly. In case we won't find designer's contact information on the site which was made from the web template for Art Photography of ours we will contact the owner of the site directly. Do you provide any scripts with your Photography School website design templates or could you do some custom programming? Our templates do not include any additional scripts. Newsletter subscriptions, search fields, forums, image galleries (in HTML versions of Flash products) are inactive. Basic scripts can be easily added to a website design template for Design News at www.TemplateTuning.com If you are not sure that the element you're interested in is active please contact our Support Chat for clarification. Can I apply a discount code to a discounted website design template for Photography Lessons or combine several discount codes together to get better price? Can I put low resolution thumbnails of web templates for Photography Lessons on my website for my clients to choose designs? Will you help me to customize my website template for Photography Portfolio? We do not provide any help or instructions on website template for Photography Portfolio customization except for www.template-help.com help center. If you are not sure you can customize the template yourself we recommend to hire a design studio to customize the template for you. What will I see instead of the images after installation of the Photography Classes website design? After Photography Classes website design installation you will see blurred images included for demo purposes only. How many applications, programs etc can I use to integrate with the Design Blog web templates under one extended license? The extended license gives you the right to use the purchased Design Blog web templates for the integration with one software/freeware/application/CMS/sitebuilder only. In case you would like to use the template with the other application, the other license is to be acquired. What do I receive when I order a website design for Photo Courses from TemplateMonster.com? After you complete the payment via our secure form you will receive the instructions for downloading the website design for Photo Courses. The source files in the download package can vary based on the type of the product you have purchased.If you need unzipping software to open the .zip archive, Windows users may visit www.WinZip.com, Mac users may visit www.StuffIt.com. Can I resell the website design for Design Portfolio as is? No, you cannot resell the website design for Design Portfolio as is. pretty easy to revise and edit using notepad ++. everything is labeled and easy to figure out. Very well made template. It&#039;s ideal for every CMS. I&#039;m use it with Wordpress. Code in files is very clean. JS scripts are reduced to minimum. Full RWD. This is my favourite! Perhaps because I used it for my own website :). So clean and easy to use and it also has allot of scope with all the elements and features included. I love the gallery on this one which is why I chose it in the first place! great job!